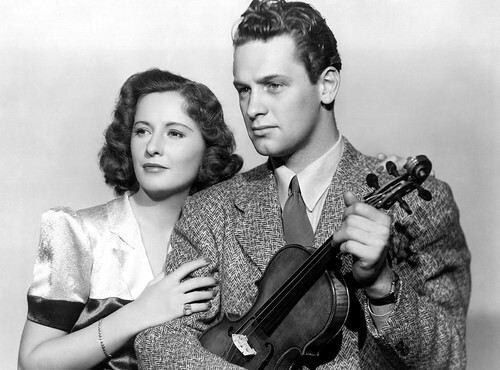 William Holden goes from classical violinist to pugilist in Golden Boy. The Stars: William Holden, Barbara Stanwyck, Adolphe Menjou and Lee J. Cobb. Source Material: The Broadway play by Clifford Odets. 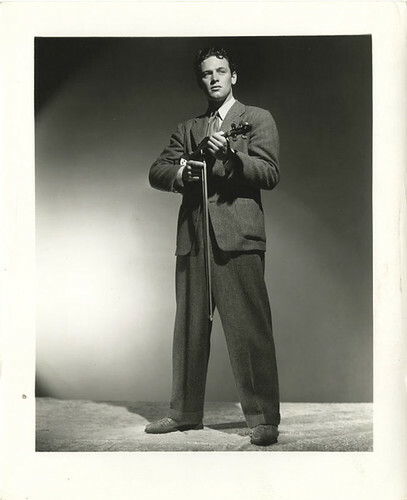 Young Joe Bonaparte (William Holden) grasps his violin in Golden Boy. Awards: Nominated for one Academy Award: Best Original Score for Victor Young. The Plot: Young Joe Bonaparte (William Holden) is the son of working class Italian immigrants. His father (Lee J. Cobb) wants him to become a classical violinist, while Joe wants to earn fame and fortune as a boxer. Joe comes under the management of boxing promoter Tom Moody (Adolphe Menjou) and his beautiful assistant Lorna Moon (Barbara Stanwyck). A vintage poster for Golden Boy. Backstory: The Broadway play by Clifford Odets was a smash hit in 1937. Columbia Pictures chief Harry Cohn bought the rights to the play with the idea that it would be directed by Frank Capra and star Jean Arthur as Lorna Moon. Capra and Arthur were busy with Mr. Smith Goes to Washington, so Cohn handed the project to veteran director Rouben Mamoulian. Odets refused to collaborate on any Hollywood adaptations of his plays, so Columbia's team of screenwriters made significant changes to the story, especially the ending, which was changed from the double suicide in Odets' original work. 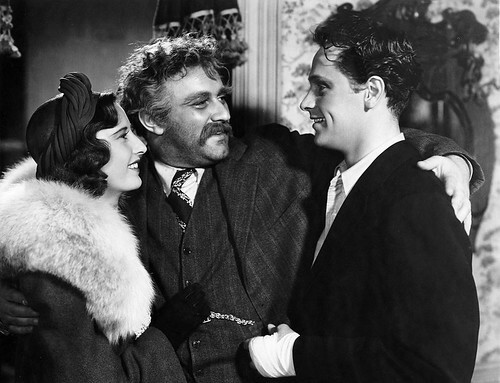 Papa Bonaparte (Lee J. Cobb) hugs it out with Lorna Moon (Barbara Stanwyck) and his son, Joe (William Holden). Best Performance: Lee J. Cobb as Papa Bonaparte. The legendary character actor was only 27 when he took on the part of the Bonaparte family patriarch who wants his only son to use his extraordinary musical gifts instead of pursuing a career in the boxing ring. Cobb is the heart and soul of the film despite the worst Italian accent this side of Chico Marx and a ridiculous mustache that is literally lopsided for the entire film. Best scene: The climactic fight scene, which was filmed on location in Madison Square Garden (clip below). Best Line: "I'm a dame from Newark, and I know a dozen ways." Lorna Moon volunteering to coax a reluctant Joe Bonaparte into the ring. The Casting of William Holden: Holden was an inexperienced 20-year-old when he was hired for Golden Boy. Cohn wanted a big-name star like Tyrone Power to play the lead role, but all the actors that were approached either turned Golden Boy down or were busy with other commitments. Holden won the part after Mamoulian saw him in a screen test and decided to give the unknown actor a shot at stardom. Stanwyck and Holden: Golden Boy was Holden's first real acting job and his inexperience and nervousness often got the best of him. Holden was on the verge of being fired by Columbia until Stanwyck interceded on his behalf. She lobbied hard to keep Holden, even going so far as to meet with Cohn himself. Holden never forgot Stanwyck's act of kindness. He publicly thanked her at the 1978 Academy Awards when they were presenting an award together. When Stanwyck received an honorary Oscar in 1982 she gave a touching tribute to Holden (both clips are below). Fun Fact: A young Alan Ladd auditioned for Golden Boy. He obviously didn't get the part, but his audition was a memorable one. The blond actor dyed his hair with cakes of mascara to make his appearance more "Italian." Things didn't go exactly as planned when he got to the studio. "It was one of the hottest days of the year," he recalled in an interview on tcm.com. "While reading the test scene, I began to feel a dripping down the back of my neck. I was taking a shower in black ink." Why it's essential: Golden Boy is a gripping drama with fine performances, especially from Cobb and Stanwyck. The climatic scene in Madison Square Gardens set the template for boxing films from Rocky to Raging Bull. Next week, Norma Shearer, Joan Crawford and company get their claws out in The Women.